How Can I Become An IHF Member? How Do I Register My School And Students? Must I Have A Building To Be An Instructor? How Can My Students Advance In Rank? Thank you for inquiring about membership in the IHF (International Hapkido Federation). The following information has been compiled to answer many of your questions about the IHF and to help explain IHF affiliation procedures and how membership in the Federation can benefit individuals, instructors, and dojangs (schools). You shall find, with this information, our on-line catalog containing DVD videos, books, and other training aids to help you with your studies and rank advancement in Hapkido as well as other Korean martial arts. If you have any further questions after reading the affiliation information please feel free to contact IHF World Headquarters for additional information. The International Hapkido Federation is an organization consisting of Individuals, Instructors, and Masters, dedicated to the education, and unification of those who wish to learn, teach, and advance in rank in Hapkido. The IHF is a non-political Hapkido organization. The IHF is dedicated to teaching the principles of Hapkido as taught by the founder of Hapkido, Choi Yong-Sul, as passed on by Grand Master Benko. 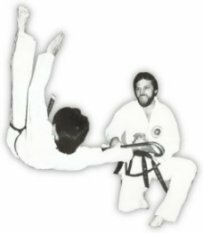 In order to provide proper leadership, direction and unity to Hapkido practitioners, Grand Master James S. Benko founded the International Hapkido Federation in 1971. Under Grand Master Benko's leadership and guidance, the IHF has become one of the most respected governing bodies of Hapkido in the world. 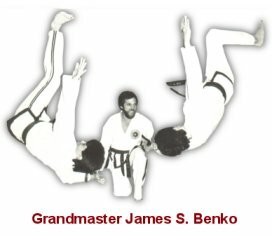 Grand Master Benko is one of the highest ranked non-orientals recognized throughout the world. IHF has developed a vast DVD video collection of training presentations, and an extensive book collection. The presentations and programs are designed to help IHF members increase their knowledge and abilities, as they prepare to advance through the ranks. The training aids can also be used to prepare individuals to advance in rank in other areas such as Korean Swordsmanship and Korean weapons. The IHF offers authentic rank certification in Hapkido, as well as instructor and dojang (school) certification. Once registered with the IHF, instructors will be able to test their students through the IHF to insure their ranks are officially registered and recognized. Those who are dedicated to practicing and teaching Hapkido can, perhaps for the first time, finally be able to take pride in the organization they belong to. The IHF is a safe haven to those who wish to practice Hapkido without having to concern themselves with power struggles amongst organization instructors. Do not be mislead by other organizations and instructors claiming to be part of the International Hapkido Federation. Feel free to use our IHF Instrructor/School Verification Form which can be found on ou main page. IHF Individual Application For Membership and Fee. Photocopy of your current Certificate of Rank. in U.S. Funds, made payable to ITA. Mail in your application, fee, and copy of your certificate of rank. For faster processing send a Postal Money Order. Once you are accepted and your application is processed, you shall receive your IHF Certificate of Rank and your IHF Rank and Identification Card. No individual 3rd degree black belt or higher, may apply for membership unless said individual has a school and is teaching. Any person who is teaching must register as an individual, a head instructor, and register his/her school and students "at the same time". The applications and procedures for this may be found under, "How Do I Register My School And Students?". Anyone who has attained such high rank and is not teaching should have no need to advance in rank as he/she is not training on a regular basis. Time in rank, in and of itself does not warrent rank advancement. If you are teaching, you must register your school and students with the IHF. See How Do I Register My School And Students?. IHF Head Instructor Application and Fee. IHF School Membership Application and Fee. IHF Individual Application For Membership and Fee (for yourself). IHF Individual Application For Membership and Fee (for each student). Once you are accepted and your applications processed, you shall receive the following: your IHF Certificate of Rank, your Rank and Identification Card, your Head Instructor Certificate, your School Membership Certificate, a Certificate of Rank and a Rank and Identification Card for each of your students, A Copy of the IHF Constitution and By-Laws, A Schedule of IHF Fees, and Applications for Promotion, for when you test your students. The IHF Constitution and By-Laws explains in detail the IHF's policies and procedures for Registering Students, Testing Students, Submitting Applications for Promotion, Rank Requirements, Uniform Dress Code, and much more. It is the Instructor's guide on how to run your school within the guidelines of the IHF. No. In order to register your School or Club and become an IHF Head Instructor, you must have at least 5 students (not including yourself). You do not have to have a "full-time" commercial school. Many instructors teach at community centers, YMCA's, church halls, sports centers, and even in their homes or backyards. It is not as important "where" you teach, as it is the "quality" of "what" you teach. The true spirit of Hapkido can be taught in one's backyard or home with only a few students, or in a full-time commercial school with hundreds of students. All you need is the ability and willingness to share your knowledge of Hapkido with others. To help insure IHF members are learning correct History, Terminology, Vital Points, Dojang Class Etiquette, and other necessary information, Grand Master Benko has created one of the world's largest collections of Hapkido DVD videos, books, and audio presentations. 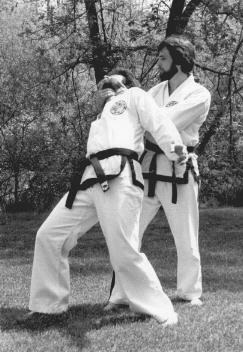 Instructors are encouraged to collect the videos, books and audio presentations regarding Hapkido theories, techniques and history, as these contain information necessary to teach what students must know in order to advance in rank. If you feel you are weak in a certain area of your training, such as kwan jyel sul (joint manipulation and control techniques) or perhaps defending against weapon attacks, you will find video training programs to help you. Once you are an IHF Certified Head Instructor, you will be granted authority to test your students through the IHF, up to one grade below your current rank. (Examples: An IHF 1st Degree Black Belt Head Instructor may test his/her students up to 1st Gup Red Belt. An ITA 2nd Degree Black Belt Head Instructor may test his/her students up to 1st Degree Black Belt, etc.). All 4th Degree Black Belt promotions or higher must be approved by the President prior to the test being given. All students must be registered IHF members in good standing in order to test. IHF members may travel to IHF World Headquarters to take their promotional examination. If an IHF school is closer than World Headquarters and the Head Instructor of that school is high enough in rank, he/she may test you. The third option is to enter the IHF External Testing Program and test via video and written examination. Under special conditions IHF members who hold the rank of 1st Gup or above may test by submitting the promotion requirements by video and written examination. Once you are a registered IHF member you may request to be admitted to the External Testing Program. Once admitted into the program you will be able to test via video and written examination. This program is available only to IHF members who, due to financial obligations, or because they live a great distance from the testing location, are unable to attend an examination at a registered IHF school. Those interested in this type of program should complete the External Testing Program Application For Admission and any other necessary forms as stated on the application. Or you may use our Online External Testing Program Application. The IHF has standardized Testing Procedures and Rank Promotion Requirements. Instructors in many other organizations are constantly confused by what they must teach for each rank. The IHF Constitution and By-Laws contains the Rank Promotion Requirements for every rank from 10th Gup White Belt up to and including 3rd Degree Black Belt. Requirements for 4th Degree Black Belt promotions or above are provided, to IHF Head Instructors or IHF members testing for these ranks through the External Testing Program. The standardization of Rank Promotion Requirements helps insure consistency in what each student learns, what the instructors are to teach at each level, and maintains the high standards of the IHF. Though the "types" of techniques to be taught are outlined, specific techniques are up to school Head Instructors. The standardization of Testing Procedures insures members that promotional examinations are conducted in a uniformed manner. If you are tired of politics infecting Hapkido, if you don't want constant changes and contradictions in the patterns you have labored so hard to learn, and if you want to join an organization which offers strong leadership, stability and unity, then the IHF is the organization for you. Since 1971 the IHF has been a leader in Hapkido. Under the IHF's guidance you and your students can continue learning, training and advancing in rank, without having to concern yourself with politics and petty bickering amongst instructors. The IHF's strong central leadership insures that the standards, quality and integrity of Hapkido are maintained at all levels. 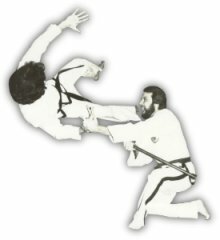 If you are truly serious about dedicating yourself to teaching Hapkido, now is the time to begin. Isn't it time you and your students received the recognition you deserve. Individuals should complete and submit the Individual Application For Membership. Instructors should also submit a Head Instructor Application and a School Membership Application along with the Fees as indicated on the forms. You can become an Instructor in one of the most respected Hapkido organizations in the World. Take the first step toward becoming a member of our IHF Family. Register Today! International Black Belt Rank Certification. International Gup (Grade) Rank Certification. Comprehensive Hapkido training DVD video collection. Special Rank Examinations (External Testing Program).